I have to admit something. I did not do any “homework” for my days in Rome and I rely on my mobile apps to do all my planning. That was why I ended up in the Vatican City on a Sunday. Not a good move. I thought that since the Vatican Museum is closed on Sundays, St Peter’s Basiilca would be free of crowds. 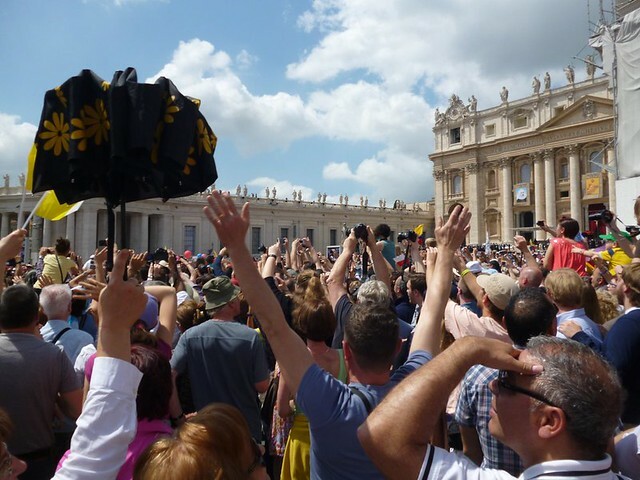 What I didn’t realize was that the queue into St Peter’s was short because about every other person was already inside listening to the pope’s mass. The square was packed with people but there was still some standing room. I stood with the crowd, peering far ahead to try and make out which rice-sized figure was the pope. 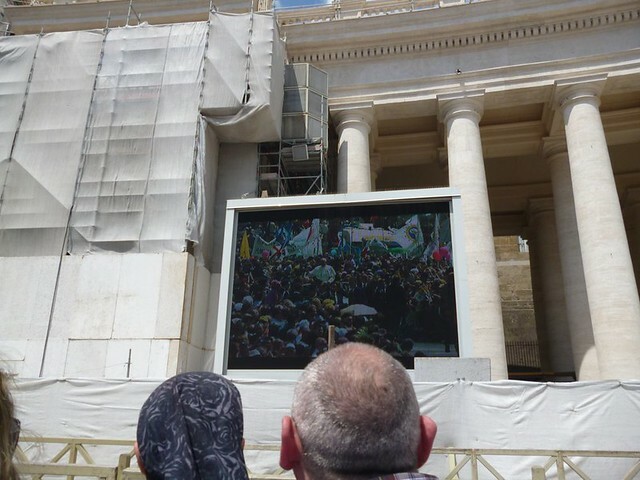 I gave up looking for the pope and settle with the big screen broadcast instead. During the ceremony, the pope seemed to shake a lot of clergypeople’s hands. He also read from a big book and wore a large hat. The fancy hat was ta ken off and exchanged for a smart white cap when the pope came down from his pedestal and into the pope-mobile. The pope waved a lot at the crowd, kissed a lot of babies and later kissed a lot of people with disabilities. I teared up a little at the last part. The pope-mobile never came to my part of the square. The people around me chanted “Fran-cesco, Fran-cesco”, hoping Papa would hear and ask his driver to steer the pope-mobile to us. When the pope-mobile was near, almost everyone (including me) cheered. It was like cheering for a rock star but one with a heaven lot more fans.